B&M is well known in NDG as a good place to get some morning food. It has a reputation of having good price and taste, and to be honest NDG does have some decent breakfast/brunch places but it could always use a few more. In my mission to check out all brunch places in each part of the city, B&M seemed like a logical choice. Take caution because there are two B&M locations: one at 5800 Sherbrooke original one at take out/delivery (with seating) and the restaurant 6200 Somerled. We initially went to the Sherbrooke location then 2 weeks later went to the Somerled location. Interestingly, the experience at both places was night and day so this will be an odd review for me. With that said, bear with me as I go over the good and not so good. Needless to say one location is better than the other but which one is it? Only one way to find out: keep reading. Both locations look very different; the Sherbrooke location looks more run down and is kind of like a quick order spot with around 20 spots to eat with simple tables and chairs. The Somerled location is much nicer with banquettes and tables and an outside enclosure in the winter. I should note that even though the Somerled location has that nice winter shelter, the cold gets in so try to avoid the tables to the front right when you walk in as they tend to get a nasty breeze. The clientele is pretty much a mixture of locals: lots of families of all ages as well as mix of students and whomever is in the area. Seats tend to fill up quickly at both locations, although the Somerled location has much more capacity and if you see a line then expect 10 minutes until you get seated since turnover at Somerled is decent (it’s not as quick at Shrebrooke but that’s because its so tiny). Although the menu is pretty much the same, the Somerled location seems to have some items not on the Sherbrooke menu, but more importantly the reality is that the selection is not the same at all. In fact, when we ordered some items (¾ of what we ordered) was not available. It was so frustrating that I wanted to take a marker and start making corrections on the menu (that and a pretty funny typo). For the purpose of selection of what’s on the menu I will use the Somerled menu since the Sherbrooke one gets food stuff from Somerled and is at the bottom of the totem pole when it comes to availability. So don’t hate them when your first, second and third choice are not available. The menu is a double-sided laminated sheet that although is broken down in many interesting sections with pancakes, combo dishes and yogourt, the sad reality is that they hardly have any of those options. I asked for yogourt at which point they said they had none of the multiple option. I then asked for a peach pancake and was told they were out of that. My friend asked for a combo plate with a danish and guess what? Yup! they were out of danishes as well. Our waitress’ response was that the other location gets most of the food and their selection is limited. Now, a common sense approach would be to change what you show on the menu if you know you cannot reliably provide it or maybe use a chalkboard or try one of those updateable digital menu boards indicating what is exactly available for that day. After a couple of disappointments we settled on something to eat. 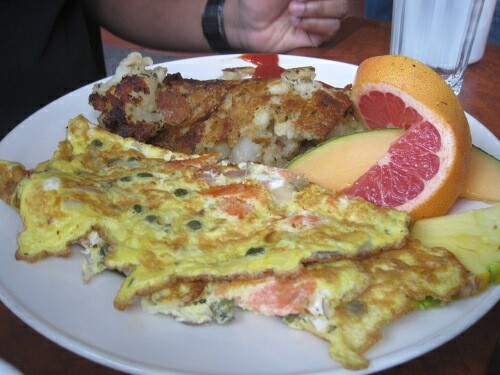 My friend had the deluxe omelette,($11.95) which had smoked salmon, onions and capers. The taste was interesting in that the smoked salmon was present although it was somewhat overpowered by the capers. While I do believe that capers go hand in hand with smoked salmon, I feel they should never overpower it. 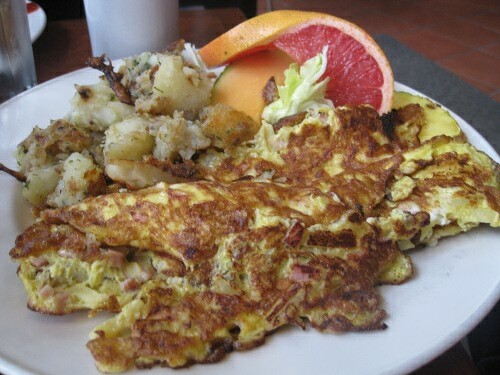 My other friend had the ham, apple and onion omelette ($8.95). The taste was OK but it really did not do anything out of this world. It came with a side of potatoes that were tasty and there was some fruit that came along with it. 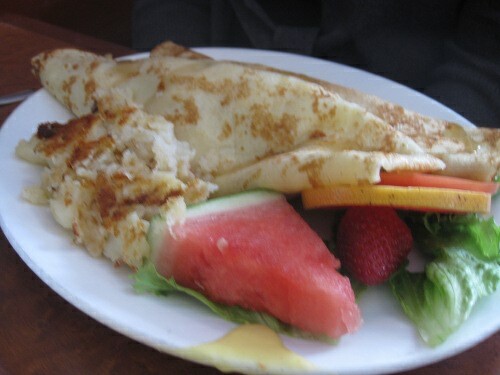 Overall, the plate was full which is always nice since omelettes tend to get shafted when it comes to accompaniment. 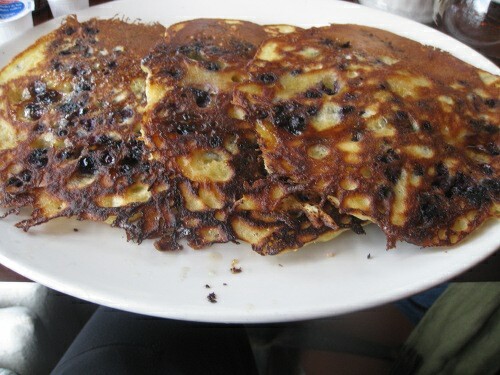 I had the blueberry pancake ($6.75) which came served as 3 giant pancakes of considerable thickness but the sides were crispened which did not really rock my boat. In fact, the taste of the pancake was lacking so much that I needed to use excessive amounts of syrup. To add, the middle of the pancake was actually liquidy, which is odd considering the outside was burnt. The menu is a nice book with a couple of pages and the big plus is that what it lists on the menu is actually available unlike Sherbrooke. My friend had the crepe B&M ($10.95) comprised of two crepes filled with scrambled eggs, bacon, sausage, ham, a side of potatoes and some fruit. The fruit was your average selection of orange and watermelon, the potatoes were very tasty and seemed to please all who tried them. The crepe itself was quite tasty and actually filling which is something you don’t actually experience with crepes most of the time. 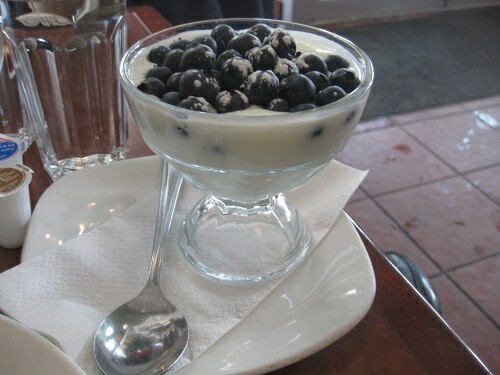 I had a starter of yogourt with Blueberries ($5.95). The size is quite large and there was a generous amount of blueberries that came with it. The only downside was that it was topped with sugar which I felt was not necessary and to be honest when you order something healthy like a yogurt you would expect them to keep it healthy and avoid putting sugar on it. 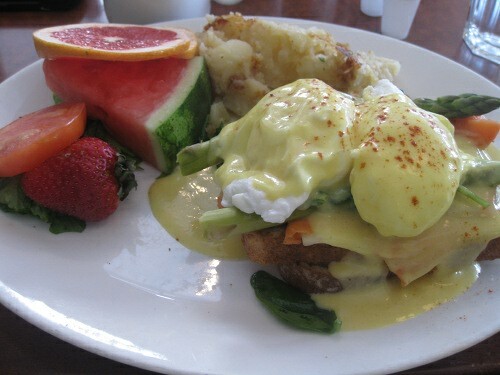 My main course was the Californian eggs Benedict ($13.95) which was an eggs Benedict dish with Asparagus on it. I felt this was a nice touch and was amazed by how perfect the asparagus was done since often it can be tough and a touch bitter, but this dish was not. Overall, it was fresh, tasty and filling and in my books, a real standout. The only downside was that at almost $14 it’s a little pricey for an eggs Benedict dish, and it didn’t even have any smoked salmon which by nature is more expensive. Service at both places was not amazing. The Sherbrooke waitress was less than amazing and she forgot to refill our coffee for the first half of our meal and to be honest when most of her answers were “we don’t have that on the menu” you can imagine how frustrated we got. The service at the Somerled location was OK and the waiter made a joke about one of us that did not go over too well (nor was it overly funny). Vegetarians will find selection here with lots of omelettes and main dishes without meat as well as a nice yogourt section. The fact that the menu has lots of options really helps open selection and ensure you can actually choose stuff (just not at the Sherbrooke location). As for vegans, unfortunately there is very little you can have unless you get the fruit cup/plates but at least they have three different sizes. Basically avoid the Shrebrooke location at all costs. In fact, if for some reason you are in the area and are too lazy to go to the Somerled one remind yourself its only 1.7km and it is worth the trip. I do strongly suggest to try the Somerled location. The menu is broad without making you feel lost, the vegetarian options are good, and the yogourt options a nice touch. I was also very impressed by the Eggs Benedict. I did feel the eggs Benedict section a little pricey on some dishes but you can get some good deals on pancakes, waffles and French toast. It’s clear from your review that you’re not from NDG. The B&M RESTAURANT is on Somerled; the Sherbrooke location is just their pick-up and delivery service (as is clearly indicated on their website). It has a few small tables that most people use for waiting, or for a quick bite. In fact, though, that location pre-dates the Somerled restaurant, which is not the “original” restaurant. 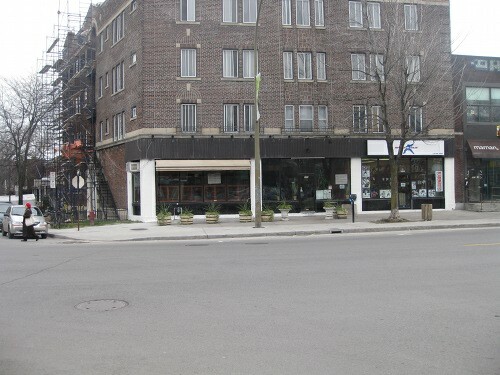 The “original” restaurant was located at the corner of Monkland and Royal. When they decided to move a few years ago, they closed that restaurant before the Somerled premises were ready, so they had no dining room at all for almost a year. The Sherbrooke location was the anchor for their pick-up and delivery service, to keep them alive over that time. Not surprising that your experiences were “like night and day” — you were comparing apples and oranges. 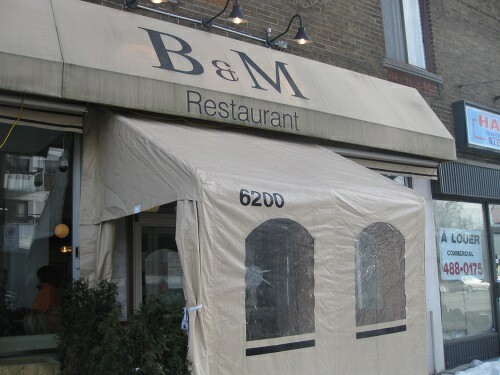 There is only one B&M restaurant. You would be doing a service to your readers if you could clarify this upfront. The Sherbrooke location does not pretend to be the restaurant. By the way, I live in the neighbourhood and eat at B&M (restaurant) a lot. Love it, and most of the wait staff are fantastic and friendly. Thanks for the correction/history lesson regarding the original location, I will make it a point to clarify it on the post. As for the pick up location, everyone who was eating there was seated and eating there longer than we were (and we stayed an hour) so it is fair to treat it like a normal sit down location. I understand that pick up location tend to focus more on speed than on food quality and the Somerled location was much better than Sherbrooke, but that does not excuse a menu that was not representative of what was available (with large sections not available) and food that was less than stellar. When a restaurant serves you something whether its a quick serve/take out or a fancy sit down they have to stand behind their food and service and it was clearly lacking at the Sherbrooke location. As well I would like to note that I held back on this review and there were other negative aspects even at the Somerled location, at the end of the day they are charging downtown prices for a non downtown location and not offering anything really unique to merit the price, but that’s my personal opinion we all have different ones, if you enjoy it then great for you. PS – The nearest metro stop to the RESTAURANT is not Vendôme, but Villa-Maria, where you can pick up the 103. For real people……let me know of one restaurant that not only has such a great selection but such fresh food!!!! As one of the friends mentioned in this article who went to both locations with the reviewer, let me just say he is being very generous with this review. I found the Sherbrooke location was almost an insult to the very aspect of breakfast. Talk about a stereotypical greasy spoon. The food was terrible, burnt even, and the service was a joke. hi. i enjoyed the supper of lamb souvlaki and french fries today. i completely understand if the waitress wasn’t in a good mood. she was either stressed of working different shift hours, or something was on her mind, maybe bothering her. i was happy to give her a good tip. she deserves it. i apologize for my friend’s behaviour. i didn’t understand nor seen someone act so snobby, mean like that, lack of respect. my friend sherika criticized the waitress and i didn’t like the comment i heard from her mouth. again, next time i go there with my friend sherika or her friends, i’ll tell her off. she can be mean to me too. It upsets me. I have to say sherika is grateful for having a job, grateful for having a boyfriend that cares about her, grateful for caring parents despite them being strict, grateful for living in a good house and good health. it’s upsetting that i became friends with her when we were in camp years ago together. im not sure if she is a true friend to me. you all are lucky to be so nice to her and let her eat at your restaurant. im hapoy your restaurant is busy and diing good in business. ive seen many restos closed down in certain areas due to many reasons. do me a favor. dont close down.